individuals affiliated with Houston Truth. What is common among those involved is a desire to share information that the controlled, corporate media won't report. Educate yourself and come to your own conclusions. Thanks to Free Press Houston our group was given the opportunity to share our message with others at the Westheimer Block Party on October 13. You don't need a vehicle to make use of a good bumper sticker. A stack of "9-11 Was an Inside Job" stickers reached the eyes of thousands over the weeked. The simple message sparked intelligent conversations, stimulated thoughts and had the crowd asking questions. 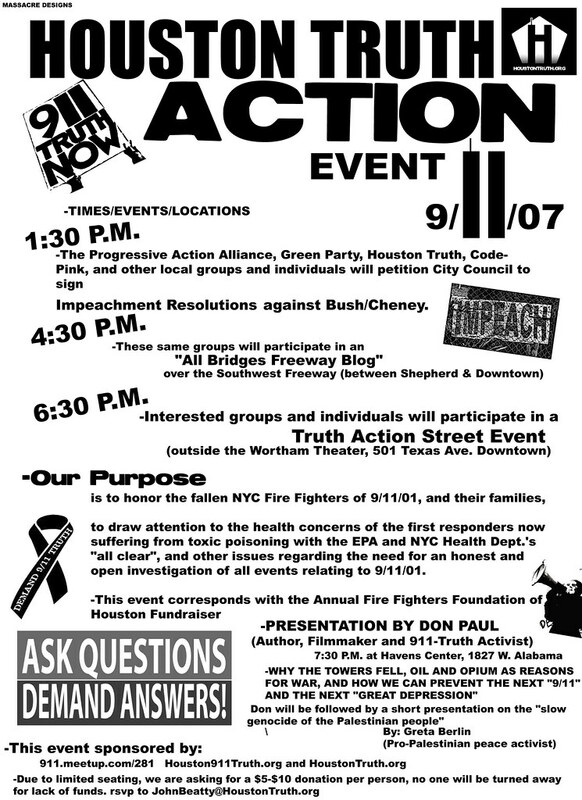 Houston Truth took serious action on 9/11/07, bringing the Truth to the sheeple of H-Town and letting the thinking citizens know they’re not alone. The image that seemed to have ignited drivers’ emotions more than the 9-11 group’s messages was that of a couple of American flags. Americans, our nation is in great danger. No, the big threat is not terrorists from the Middle East. The source of danger to our lives, our freedom, and our way of life is our own complacency – our willingness to be led. In the Declaration of Independence, Thomas Jefferson wrote: “All experience hath shown that mankind are more disposed to suffer, while evils are sufferable than to right themselves by abolishing the forms to which they are accustomed."